Advance C™ Series is ideal for a wide range of light industrial and commercial water & wastewater disinfection applications. Designed to deliver UV dose*>40mJ/cm2 over a wide range of UVT levels and flow rates up to 40L/min, Advance C™ Series is popular in industries like food & beverage, drinking water treatment, irrigation, process water, aquaculture, healthcare and many commercial businesses. * Contact us for UV sizing advise if you are looking for other UV dose levels, UVT and flow rate combinations. 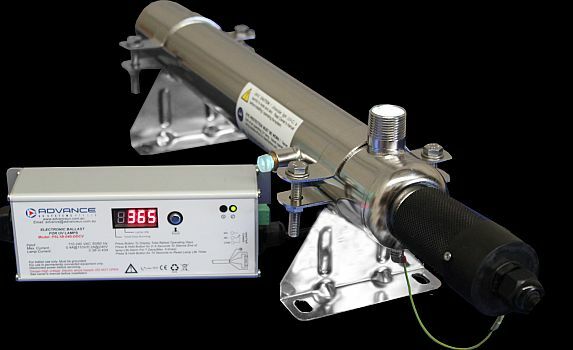 Advance C™ Series features marine grade SS316 UV reactors, high performance quartz UV lamps matched with tuned electronic ballasts and turbulent flow design in a single lamp reactor configuration to deliver reliable disinfection performance. Options include a choice of power supplies optional UV intensity sensors, UV monitors, PLCs, quartz sleeve wipers, Ozone producing UV lamps and temperature control devices . Advance C™ Series industrial UV systems are very easy to install, easy to use, easy to maintain and known to be very reliable. The table below shows Advance ADV-C™ Series UV units for EOL (end of lamp life) UV Dose of 25mJ/cm2 (250J/m2) @98%UVT10. For other UV dose, Peak Flow Rate and %UVT requirements, please contact us. Advance ADV-CLT™ Series is designed to handle variations in UVT from 50% to 98%. The table below shows Advance ADV-CLT™ Series UV units for EOL (end of lamp life) UV Dose of 25mJ/cm2 (250J/m2) @98%UVT10. For other UV dose, Peak Flow Rate and %UVT requirements, please contact us. Different versions available all with standard 10A GPO plug and 2m lamp lead. Suitable for all models from ADV-C50 to ADV-C400 Includes visible and audible lamp fail alarm, for indoor operation only. Dimensions: 105 x 60 x 30 mm, Weight: 0.4 kg. Optional weatherproof IP65 outdoor version available. Suitable for all models from ADV-C50 to ADV-C1800 Includes visible and audible lamp fail alarm, volt free contacts (BMS), lamp operation count down timer 365- 0days, lamp change alert, for indoor operation only. Dimensions: 205 x 75 x 53 mm, Weight: 0.7 kg Optional weatherproof IP65 outdoor version available. To get the desired disinfection performance from your Advance C™ Series UV unit, we recommend regularly servicing the UV unit, replacing the UV lamp, O ring and cleaning the quartz thimble. Contact us for with any UV related questions or your Advance UV Lamp number and Advance UV reactor number for advise or any Advance UV lamps, Advance UV quartz sleeves, Advance UV ballasts, Advance UV O rings, Advance UV sensors and Advance UV spare parts. We would be delighted to put you in contact with the right Advance UV sales and service partner for Advance ADV-C and ADV-C LT spares & service.